Open from 10.00 to 18.00. Open every day (Monday to Sunday). The Pantheon will close at 17.00 on the 24 and 31 December. Last admission will be 45 minutes before the respective closing time. The museum will be closed on 1 January, 1 May, 17 June (morning only), and 25 December. At these times the museum will be less busy. We are comparing Paris Pantheon Skip the Line Ticket Prices from leading ticket suppliers and Try to find you Cheap tickets prices on the market. Located in the Latin Quarter of Paris the Pantheon was originally built as an abbey in commemoration of the Patron Saint of Paris, Saint Genevieve. In the 18th century this neo-classic church was converted into a mausoleum under the instruction of the French Government. The unique building still hosts a series of painting and murals which narrate the life of the great saint and tell the story of early Christianity. Since the church was renamed the Pantheon in 1791, the building’s main use has been to house the remains of deceased French writers, politicians, military leaders, scientist, clergymen and other famous French men and women. The Pantheon in Paris should spark the interest of historians, artists, architects and anyone interested in paying a visit to ancient underground burial sites. People interested in the religious history of Paris may also like to visit this cultural city attraction. Although the site is not suitable for wheelchair users or visitors with severe walking difficulties, it would be appropriate for families with children as will at adults. Your Experience With Paris Pantheon Skip the Line Ticket? Take advantage of fast-track entry to one of the most popular museums in Paris. Take your time to explore the interior on a self-guided visit of the Pantheon. 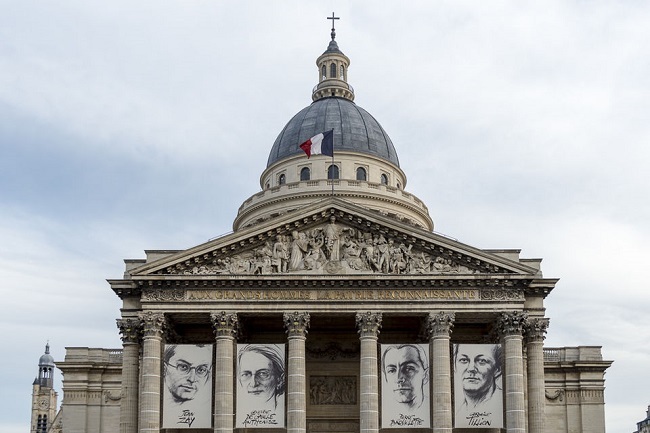 See the final resting place of over 70 significant persons in French history, including Emile Zola, Alexandre Dumas, Marie Curie, Voltaire, Louis Braille, Jean-Jacques Rousseau, and Victor Hugo. Admire fantastic artworks depicting the progression of the French monarchy, French saints, and the birth of Christianity. What Paris Pantheon Skip the Line Ticket Includes? Free visitor booklet in English, French, Spanish, Portuguese, Italian, German, Russian, Polish, and Chinese. We recommend dressing conservatively or bringing a scarf to cover your shoulders during the summer months. Visitors who are not dressed appropriately may not be permitted to visit the crypts. Travelers Reviews about Paris Pantheon Skip the Line Ticket? The Pantheon Museum has an excellent 4.5 out of 5 rating from travellers on TripAdvisor and the majority of reviewers would recommend visiting this famous monument. Some reviews point out that parts of the museum are closed to the public, however, most agree that the Pantheon is still worth visiting. Visitors frequently comment on the amazing architecture and historical features within this attraction. With regards the skip the line tickets, those who have purchased from Get Your Guide have left an average rating of 4.5-stars while Viator has an average rating of 5 out of 5-stars. Travellers tend to agree that the tickets are easy to use, convenient and will save a lot of time. Hearing and visual aids are available to visitors however the site is not practical for wheelchair users due to large amounts of steps. Visitors should be able to climb/descend 16 steps to enter the Pantheon from the roadside, 38 steps to visit the crypts, 80 steps to the inner gallery and 200 steps to the outdoor colonnade. You will receive an email confirmation at the time of booking. Tickets for this self-guided tour are non-refundable and cannot be changed. Access to the upper floor of the Pantheon is not included in the ticket price. It is open from April to October only and you can purchase the entry ticket onsite (approximately €2). Parts of the museum (primarily the Simone Veil Monument) will close early on certain dates. There may be a short wait at the entrance due to airport-style security checks. Large bags and suitcases will not be allowed inside and there is no luggage storage onsite. Eu citizens aged under 26 and all visitors aged under 18 can visit the Pantheon for free. You must bring a valid ID or passport. Visitors are required to dress appropriately when visiting the crypts (i.e. no shorts, sleeveless top, or clothing with offensive symbols. Audio guides are not included but can be rented at the entrance. Meeting Point: go directly to the entrance of the Parthenon. You do not need to join the entrance queue. Address: Place du Panthéon, 75005 Paris.